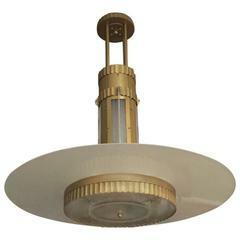 Stunning French Art Deco chandelier by the French artist "Sabino". With six beautiful clear frosted molded glass shades having skyscraper geometric motif. Polished details mounted on a silvered bronze frame with a floral design. Height can be adjusted upon request. Pair of chandeliers available and matching pair of sconces. Six clear frost glass with high light polish, nickel on bronze frame chandelier. Total of 12 lights, 60 watt max each.